Granola-Banana Sundae - A recipe from Savor California, the online showcase for extraordinary gourmet foods and beverages from California. 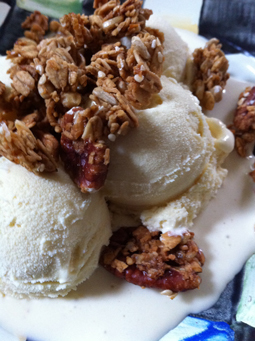 Top scoops of banana ice cream with Ginger Pecan Granola. Ice cream "drumsticks." Put banana ice cream in a cone. Roll the ice cream in the granola. Ice cream balls. Roll small balls of banana ice cream in slightly broken-up granola. Place banana leaves on plate and top each plate with 3.